Where did Thomas Paine grow up? 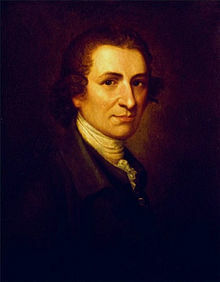 Thomas Paine was born in Thetford, England on January 29, 1737. His father, Joseph, was a tailor who specialized in corsets. His mother, Frances, came from a wealthy family. Thomas grew up as an only child. His only sibling, a sister, died when she was still a baby. Thomas' parents each came from a different Christian religion. His mother, Frances, was a member of the Anglican Church. His father was a Quaker. The Quakers were looked down upon by most of English society. They fought for the rights of all people and considered all people equal before God. Thomas' parents often argued over religion and religion would shape a large part of his life. He wrote some of his essays on the subject. Some people say that he was an atheist who did not believe in God, but he actually stated many times that he did believe there was a God. The Quaker beliefs of his father would also influence Thomas' other writings and political beliefs. Thomas attended the Thetford Grammar School where he learned to read and write. When he turned thirteen he became an apprentice to his father. His early life and career was marred with disappointment. For a time, he ran away and became a privateer, sort of like a legal pirate. He then opened his own corset shop, but it failed. Later, he got a job as a customs officer, but before long was fired. Paine was in debt and needed a change in his life. He met an American named Benjamin Franklin in London who told him he should move to America. In 1774 he sold his house to pay off his debts and took a ship to Philadelphia. Thomas got his first job in America as the editor of the Pennsylvania Magazine. He began to write articles for the magazine as well. Many of his articles denounced injustice in the world such as slavery. Thomas soon became interested in the American Revolution which began in 1775 with the first shots being fired at the Battles of Lexington and Concord. On January 10, 1776 he published the pamphlet Common Sense. Common Sense put forth an argument that the colonies should break away from British rule. Thomas wrote in such a way that the average reader could understand his argument and would be forced to make a decision. Many people of the time were still undecided. After reading Common Sense, they became convinced that revolution and independence from Britain was the best direction for the colonies. Common Sense became a best seller. It sold over 100,000 copies in just a few short months. 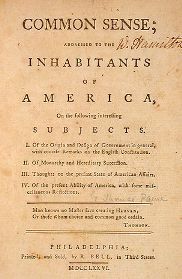 Through his writing Thomas Paine had convinced many undecided people to become patriots. For this reason he is sometimes called the Father of the American Revolution. Paine became an assistant to General Nathaniel Green during the war. He also wrote several "crisis" papers that were distributed to the American troops in order to inspire them. He later worked as a clerk for the Pennsylvania General Assembly where he learned that the troops needed food and supplies. He began an effort to raise supplies for the troops including asking France for aid. After the Revolutionary War ended, Paine went back to Europe and became involved in the French Revolution. He wrote Rights of Man in support of the French Revolution. He was even imprisoned for a time. Paine returned to the United States and died in New York City in 1809. He was not popular at the time and only a few people came to his funeral. "The harder the conflict, the more glorious the triumph." "Those who want to reap the benefits of this great nation must bear the fatigue of supporting it." He nearly died of typhoid fever on his first trip to America. Paine was also an inventor. He received a patent for a bridge design and invented a smokeless candle. He wrote the Age of Reason later in life which criticized organized religion. His article titled Public Good argued that the Articles of the Confederation should be replaced with a Constitution that formed a strong central government. Paine's writings also influenced future Americans such as Abraham Lincoln and Thomas Edison.